Sen. Harsha Prabhala, MISPH-G, presents the Graduate Umbrella Student Organization Student Fee Act to the Student Association. The bill, which the SA passed unanimously, increases the number of graduate student organizations with the ability to distribute SA funding to smaller organizations. GW’s graduate student organizations are about to get a little richer. A bill unanimously passed by the Student Association last week will let more umbrella graduate student organizations opt-in to receive money collected through student fees. Leaders of those groups said they will be better able to create events for all GW students now that they have access to SA funding. 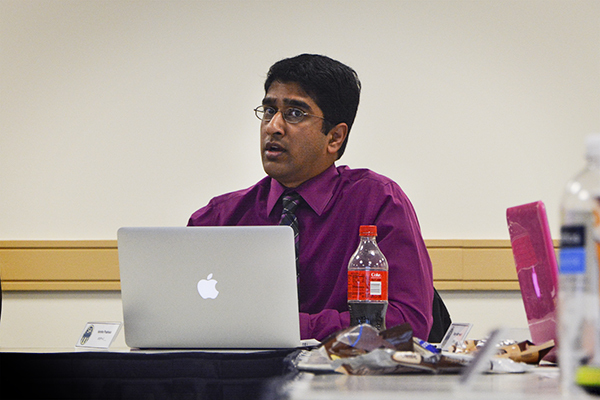 Sen. Harsha Prabhala, MISPH-G, said the changes will allow for more graduate student groups to be considered umbrella groups, which distribute funds to smaller organizations within each graduate school. Under an older bill passed in 2012, only a certain number of organizations could opt-in for the allocations. New umbrella groups could not be added to that list, which student leaders said resulted in smaller amounts of funding for those groups and all organizations under them. More graduate students will now be able to participate in events that their student fees paid for, rather than watching their own dollars being used to fund programming that they may not be able to participate in, students added. The larger umbrella organizations receive funds from the SA’s finance committee, which they then individually allocate to every group within their graduate school. Stuart Portman, the president of the Public Health Student Association, said his organization was only allocated $3,505 last year, or about 10 percent of the student fees paid by public health students. Each graduate student is charged $1.50 for each credit hour he or she takes, which totals his or her student fee. The University matches that amount and undergraduate student fees to make up the SA’s $1.1 million funding pool. Portman said he worked with Milken Institute School of Public Health Dean Lynn Goldman and other organizations to turn his group into the umbrella organization for all public health student groups. He said he believed one of the reasons PHSA was allocated so little money last year was because the SA did not believe PHSA was a “real” organization. Portman said the communication issues stem from the SA allocating money to both undergraduates and graduates. Most other universities have separate student associations for each. But he said he hopes these funding changes will help bridge the gap between the two populations of students. He added that graduate students are often willing to get more involved on campus through student organizations in their graduate schools, but are discouraged by administrative hurdles, like having to submit a budget to the SA for funding. Having umbrella groups deal with those allocations lessens their burden. Helen Clemens, the outgoing president of the Student Bar Association, said the funding change will make graduate student groups more independent and will allow them to have more structure when it comes to planning events and other programming. “Once you have the certainty of where your financing is coming from, you don’t have to worry about your fundraising to be able to advertise to undergraduate students,” she said. The SBA has hosted events for the entire University this academic year. The organization helped bring Supreme Court Justice Ruth Bader Ginsburg to campus in September. Andrew Ligon, the president of the Elliott School of International Affairs Graduate Student Forum, said that with more access to their own student fees, his group and others will be able to host more programs for all students. The student forum had previously not been allocated funds because it hadn’t been included in the first graduate organization funding bill.